Alison Brown and Deering unveil their new collaborative low banjo inspired by John Hartford. Find out more. 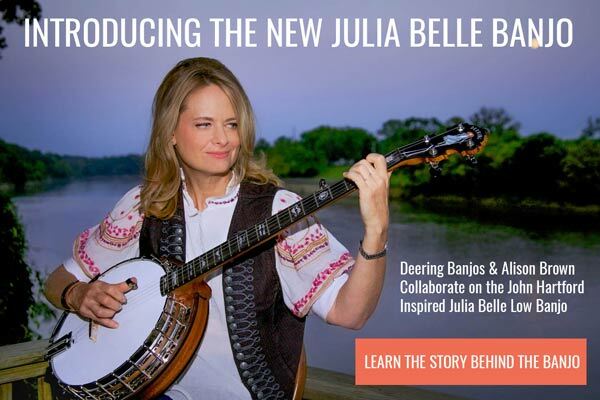 Deering is delighted to introduce you to the Julia Belle Banjo. The new Julia Belle low banjo is a unique collaboration between Deering and banjo icon, Alison Brown. The 24-fret low tuned banjo features John Hartford’s hand drawn artwork on the fingerboard as well as design aesthetics and features customized by Alison herself. The result is an absolutely gorgeous and unique instrument that reaches across time and generations for its inspiration. You received this email because you are subscribed to Deering Banjo Email Newsletter from Deering Banjo Company.